Girl Scouts never leaves you, even if you leave it. I was a Girl Scout in elementary school, but unfortunately didn’t have amazing leaders to make the experience special. I quickly dropped out. However, in time’s passing I learned what it takes and means to be a Girl Scout, even if you don’t officially hold the title. If leaders remind girls how awesome they are and give them opportunities to have fun, enjoy, and explore like I did, maybe other Girl Scouts won’t have the same organizational experience I did. It will be better. I’m trying to do something about that. 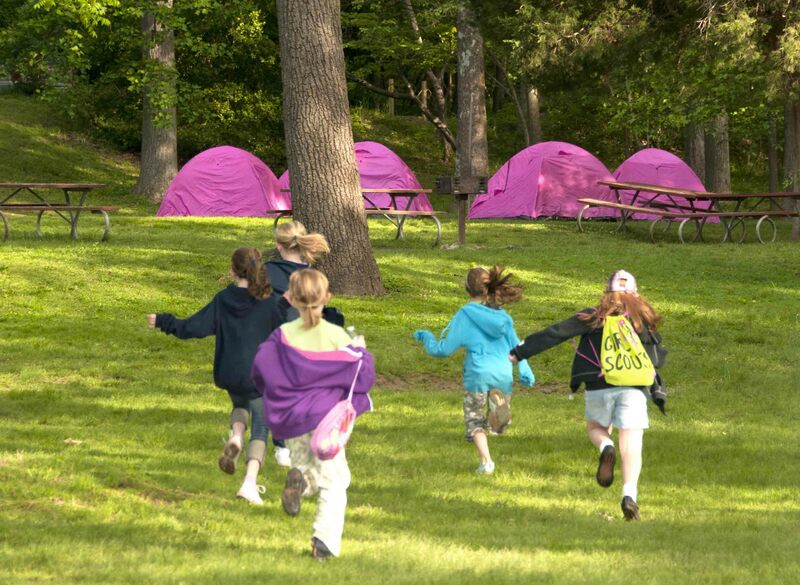 Girl Scouts return to their tents during an overnight at Riverbend. When I arrived at Riverbend Park, Girl Scouts were rebranding with new badges and a new mindset. The focus was less about getting badges done and more about exploring the topics and generally having fun with them. I jumped on that and quickly became involved in organizing Girl Scout activities and planning badges to offer local troops. One activity became my favorite: the overnights. Overnights are wonderful. They’re a chance for girls to bond with their troop, to explore something new, to get away from home for one night, which many of the younger ones have never done. Common when I was younger were team games that revolved around either sports or names. I remember being so bored that I would lead the groans of complaints whenever someone said we’d be playing a team game. However, I learned that games don’t have to be about how well you throw a ball or run. There are games about teamwork and games that need everyone to win a round. The stars of Riverbend overnights are games that highlight uniqueness rather than shun it because this is where girls learn the quirks of their friends. Who has the biggest shoe? Who can sing? Who knows the funniest joke? You don’t learn these things during Capture the Flag, but you do learn them at a Girl Scout overnight. No Girl Scout overnight is complete without a campfire, and no campfire is complete without s’mores. Tired of s’mores? Try Can O’ Crispies, Banana Boats, or Dough Boys. Raining outside? Learn how to make your own ice cream, or make a cold s’more with graham crackers, marshmallow fluff and chocolate spread! If there isn’t a dose of past-your-bedtime sugar, something’s not right. We are taught at a young age to repeat. Doctors say that’s how we learn speech and behaviors as we grow. Girl Scouts are the super power of repeat songs. If you’ve never heard 150 Girl Scouts singing about a rick-a-bamboo at the top of their lungs, you haven’t lived. I have a book of songs, and I pull them out while around a campfire, hiking on a trail and just going about my day. Most girls know The Princess Pat. They learn it from other scouts, friends at school, and their scout leaders. Some know Great Big Moose (a song about a moose named Fred who loves to drink juice), a few know Tarzan, and fewer know about Red Rose and the Briar. Singing puts everyone on equal ground. I make sure to sing as badly as possible so that even the least talented singers feel like they’re doing a great job. Singing also creates strong memories for girls, making them happy and confident with themselves and their friends. Everyone must sing at Riverbend Girl Scout overnights, and everyone must sing louder than me, no exceptions. We have fun throughout the night, and we all enjoy the time together, including the 3 a.m. shriek that a spider is on someone’s pillow. That’s all very well and good, but the final word? The very best part about Girl Scout overnights? For me, it’s at the end, when everyone’s packing and loading the cars. Not for reasons you might think, though. It’s when girls come to me saying they want to come back tomorrow. It’s when scout leaders say this was one of the best events they’ve attended. Throughout the site, I hear girls complaining they don’t want to go, phone numbers being swapped with new friends, and one last round of the cup game before jumping in the car. At the end is where you see how much fun everyone had, parents included. When it’s time to go and they don’t want to go, it’s clear the event was a success. There are memories the girls aren’t soon to forget. So, to answer the question: What is a rick-a-bamboo? The Princess Pat used it to rescue Captain Jack from the Channel 2. We know it’s red and gold, and purple, too. but primed for a rerun. 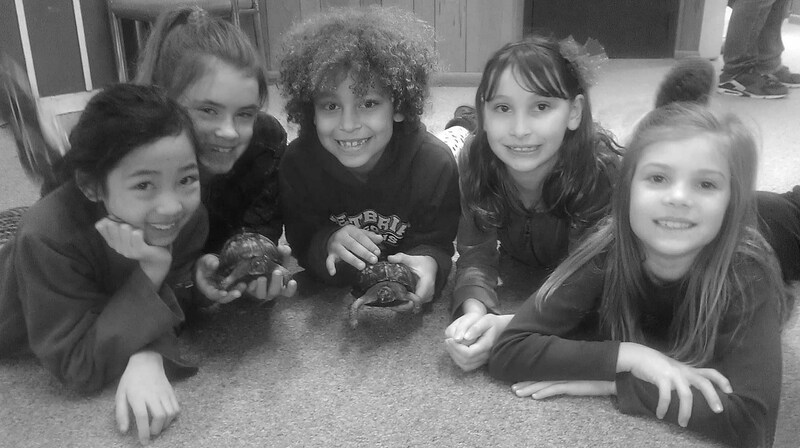 Riverbend Park naturalists offer Girl Scout programs and sleepovers at their nature center along the Potomac River in warmer months and at historic Dranesville Tavern multiple times a year. Programs for Boy Scouts and Girl Scouts are held in parks across the county. Author Michelle Brannon is a naturalist at Riverbend Park in Great Falls. This entry was posted in Uncategorized and tagged Girl Scouts, Riverbend Park on October 1, 2014 by Fairfax County Park Authority. Our phone has been ringing constantly this week and the main question is “How far along are the bluebells?” One caller said that she has a friend who visits every year around this time and that her two favorite things to do are see the cherry blossoms and come to Riverbend to experience the bluebells. Some of the flowers are blooming now, and for the next two weeks the bluebells will put on a spectacular show. As I walked the river trail this morning I saw all the tightly packed pink blossoms that look like they are about to burst. Insects were flying around and crawling on the leaves. For me, I like to take in the whole forest floor covered with wildflowers and then kneel down for a close inspection of all the life on and near each plant. Don’t forget to join us this Saturday (April 12) at Riverbend Park from 10 a.m. until 2 p.m. as we celebrate the bluebells at our second annual Bluebells at the Bend Festival. The event costs just $5 person and features live music, wildflower walks, live animals, face painting, wagon rides, and other family fun activities. For more information, call Riverbend Park at 703-759-9018. 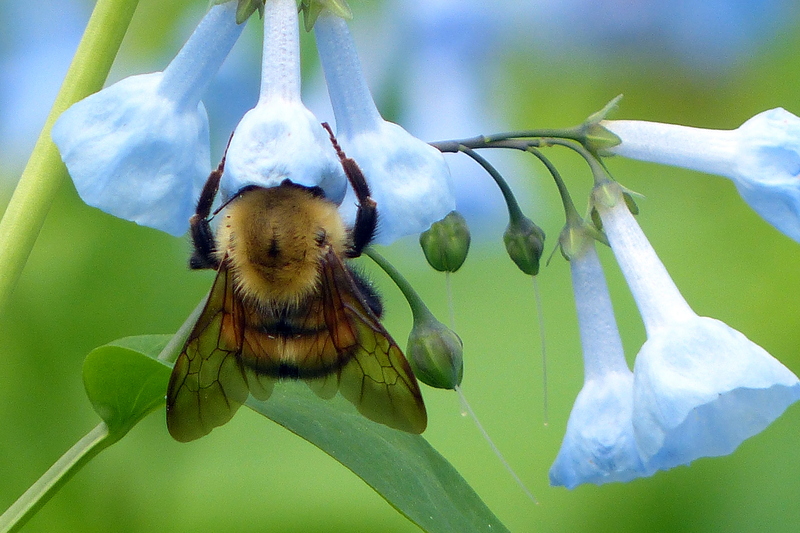 Bumblebees are big fans of bluebells, too. Snow earlier this week and frigid nights can’t stop the progressing bluebells. Their leaves continue to push through snow, ice and whatever else the weather brings. These hardy plants are starting to take over the forest floor. 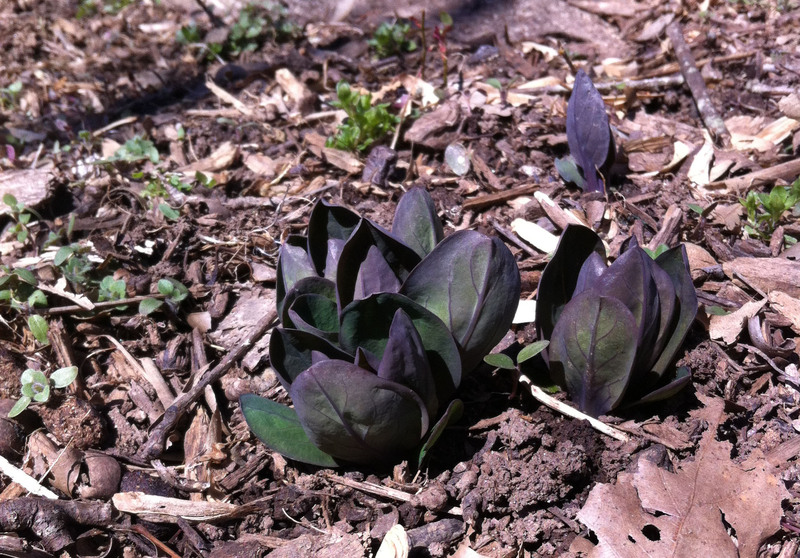 The dark leaves have now taken on their familiar succulent green color and the deep purple flower buds are clustering. The coming weeks will offer visitors one of nature’s finest floral displays. Spring beauties, cut-leaved toothworts, trout lilies, and a host of other beautiful wildflowers will mix in and add texture to the bluebell palette. 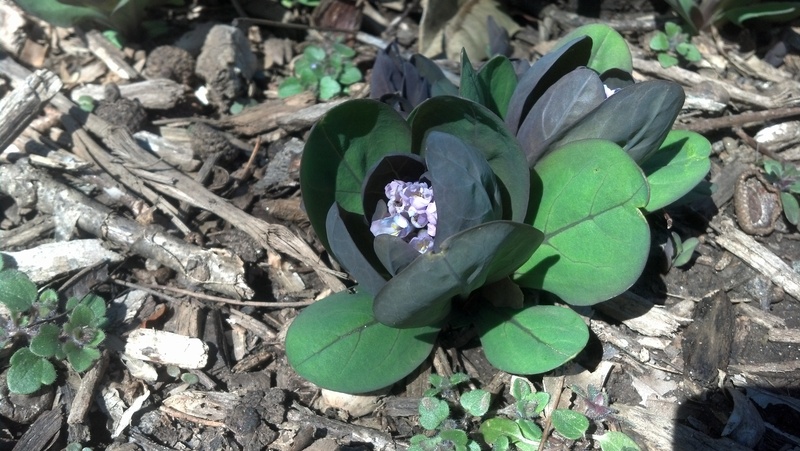 One of the earliest wildflowers, harbinger of spring, is already in bloom. This small member of the parsley family stands only two to three inches tall. Harbinger of spring in bloom. When the flowers are in bloom, take time to thank a pollinator. Pollination of spring wildflowers is completed by a host of insects. Bees and butterflies visit the colorful blooms spreading pollen. Some wild flowers like the sessile trillium do not rely on brightly colored blooms that attract visual pollinators. Their flowers produce a rotting smell which attracts beetles and flies to spread pollen. Stop at a cluster of wildflowers for five minutes and observe the wide variety of bees, butterflies, flies, and beetles hard at work. Don’t forget to join us at Riverbend Park on April 12 from 10 a.m. until 2 p.m. as we celebrate the bluebells at our second annual Bluebells at the Bend Festival. The event costs just $5 per person and features live music, wildflower walks, live animals, face painting, wagon rides, and other family-fun activities. For more information, call Riverbend Park at 703-759-9018. Virginia bluebells push through the floodplain at Riverbend Park. March has arrived with snow, sun, and temperatures that are bouncing around like a rubber ball. Despite the dramatic weather, Virginia bluebells continue to push through the fallen leaves and soil as they progress toward their breathtaking explosion of color in April. Leaves are just starting to transition from deep purple to hints of delicate green. The cherry blossoms are predicted to peak April 8 through12. At Riverbend Park, we expect the bluebells to peak between April 8 and April 15, just in time for the Bluebells at the Bend Festival slated for April 12, 2014. Unlike the cherry blossoms, which were a gift from Japan, the bluebells are a native gift to river floodplains and Riverbend Park provides the perfect garden. Bluebells, along with many other spring wildflowers including spring beauties and cut-leaved toothwort, are called spring ephemerals. They bloom early and then by May all that is left are withering leaves and seeds. Come mid-May, bluebells pull a vanishing act, leaving no visible trace of their existence. All of these hardy wildflowers take advantage of the sunlight reaching the forest floor before the towering trees re-grow their leaves and close the forest canopy. In March more than 50 percent of the available sunlight reaches the forest floor. By mid-April this drops to 30 percent and then to 10 percent come May. The bluebells and other spring wildflowers produce a different experience for everyone. The experience is personal and cannot be duplicated by pictures or stories. I enjoy talking to visitors and staff about the bluebells and hearing their stories. Each experience is unique and private, but I am glad they decide to share it with me. 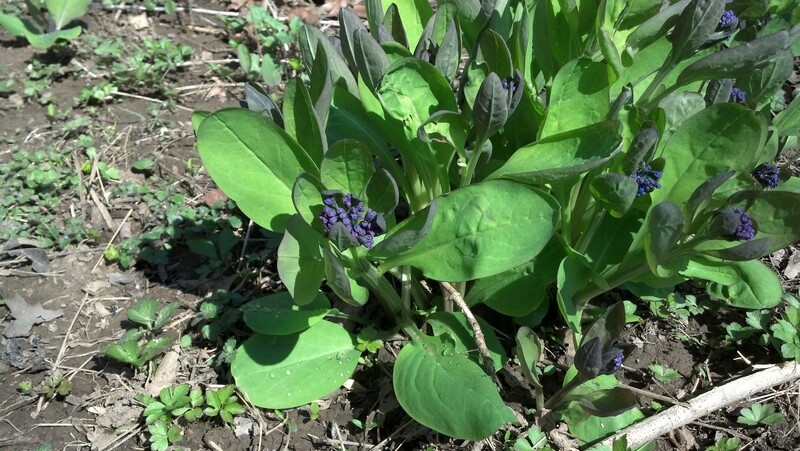 Virginia bluebells resemble dark purple spinach leaves. Winter’s grip gradually relaxes with each passing day. Patches of snow cling to every bit of shade as the late winter sun shines through the leafless trees. Something stirs just under the surface that reminds us of nature’s yearly cycle and the interaction between ecosystems. Spring wildflowers are taking in nutrients and available water and pressuring the soil as they prepare to erupt with an array of blooms that magnificently display the season. 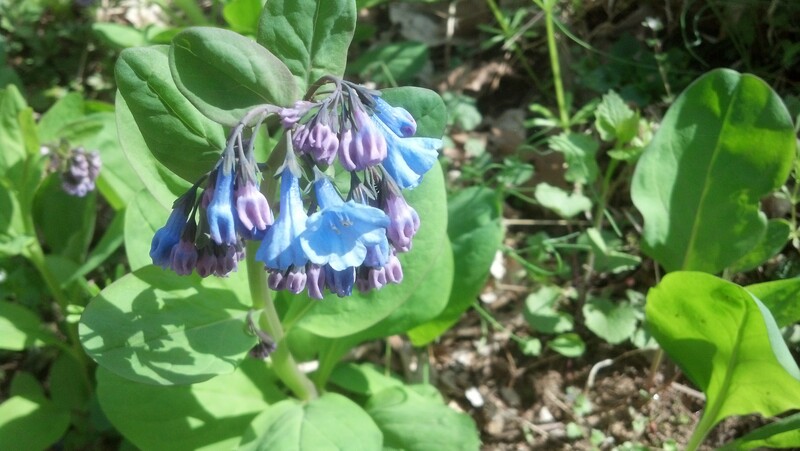 One wildflower in particular shows its colors like no other, the Virginia bluebell (Mertensia Virginica). “The most important part of bluebell season is when the purplish green leaves start breaking the soil in late winter early spring. It gives one hope that spring is riding the longer days to arrive,” Fairfax County Park Authority Naturalist Jim Dewing said. The scientific name honors the German botanist Franz Karl Mertens, a German botanist (1764-1831.) The species name refers to Virginia, where the plant was first identified. Thomas Jefferson grew Virginia bluebells at Monticello. 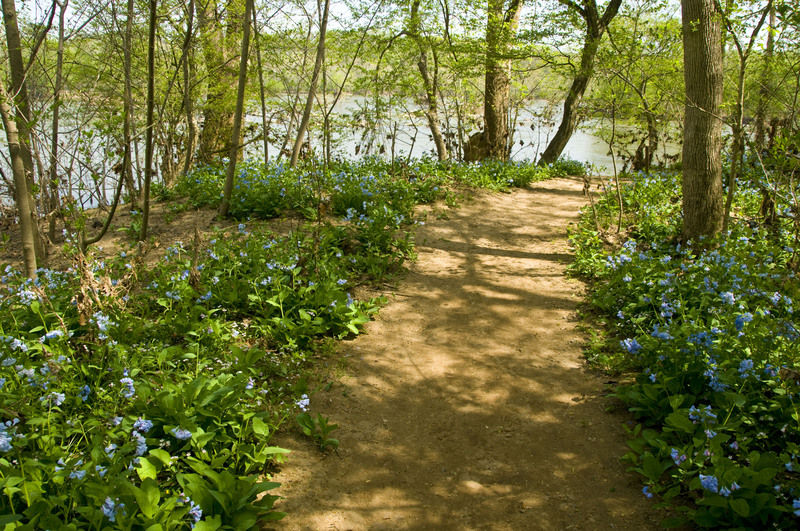 The bluebells at Riverbend Park in Great Falls, Va., were not planted by anyone; the river, wildlife, and climate have all pitched in to create this native garden. Bluebells thrive in rich floodplain soils that are replenished each year by floods. This time of year they superficially resemble dark purple spinach leaves slicing through the sand and silt. 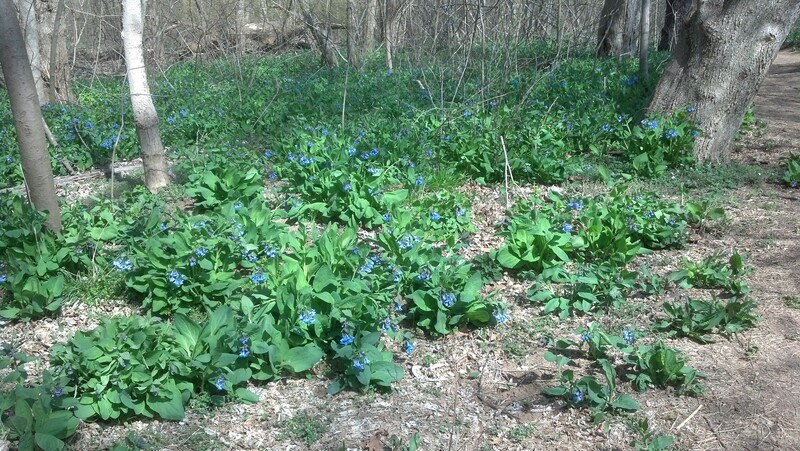 By mid-April their purplish blue blooms will adorn acres and acres of forest floor at Riverbend Park. Bluebells spread like a carpet of blue at Riverbend Park. I invite you to come to Riverbend Park on Saturday, April 12, 2014 from 10 a.m. to 2 p.m. as we celebrate spring at our Second Annual Bluebells at the Bend Festival with live music, wildflower walks, live animals, face painting, wagon rides, and other family fun activities. Admission to the event is $5 per person. For more information, call Riverbend Park at 703-759-9018. This page will be updated weekly with photos of the blooming bluebells, so check back often. Author John Callow is the assistant manager at Riverbend Park. This entry was posted in Uncategorized and tagged Flowers, Great Falls, Hiking, outdoors, Potomac River, Riverbend Park, Spring, Virginia Bluebells, Wildflowers on February 24, 2014 by Fairfax County Park Authority. Most people around Northern Virginia probably don’t get to see what wildlife is doing on a daily basis, and there is a lot of wildlife here. 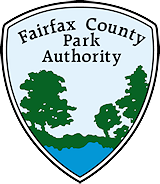 The Fairfax County Park Authority has several ways of connecting people and wildlife, such as nature centers and hiking trails. One of the fun methods of connection is the candid camera. Since January, Riverbend Park staff has been conducting a camera-trap survey to learn about wildlife in that park. Cameras with infrared sensors that detect both heat and motion, called trail cameras or game cameras, are placed along wildlife trails. When an animal drifts by and breaks the infrared beam, the heat or motion triggers the camera, which can be set to record one or multiple frames. The boxes can be fitted with an infrared flash that will limit any disturbing of the animals. And the cameras can be programmed with a delay of five or ten minutes between shots so that the same animal isn’t photographed dozens or hundreds of times while hanging around. Staffers never know exactly what to expect each time they check the camera storage cards. 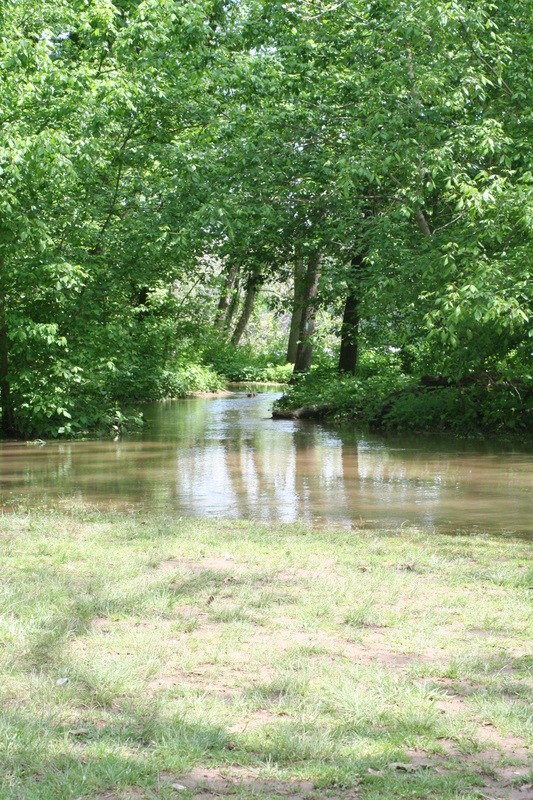 Riverbend features a large meadow, a riverbank, creeks, ponds, and deep forests — diverse habitats. These combine to host a wide range of wildlife. Sometimes thousands of pictures reveal nothing. Other times, there are pleasing surprises. Among Riverbend’s photobombing animals are coyotes, which confirms their presence in the park. The most common visitors strolling past these cameras have been white-tailed deer, raccoons, and gray squirrels. Foxes and otters also have stopped by for portraits. Riverbend Head Camp Counselor Brian Balik, who uses his own cameras to record some of the photos, says his favorite picture so far has been that of a red fox with white legs. Those are unusual markings and something he’s not seen before. This fox showed off its unusual white legs for the camera at Riverbend Park. The value in these photos is in learning what animals are around. That helps staff know what steps to take to protect the wildlife. Years ago, people had to rely on actual sightings of animals. Now, staff can see exactly what is in a specific area 24 hours a day, seven days a week. The cameras also reveal animal behavior. They record the times the animals are awake, the population, the areas of a park they use, and how frequently they use particular areas. Riverbend staff is hoping the cameras will help them learn where the visiting coyotes live and whether their home is in the park. Huntley Meadows Park staff used four infrared cameras in 2011 to survey the population of deer at Old Colchester Park on Mason Neck. Huntley Meadows Resource Manager Dave Lawlor analyzed almost 4,000 photos in the Old Colchester survey, and he pointed out that reviewing them on a computer became a little strange because, since the camera doesn’t move, the background of the photos never changes. “It makes your eyes go fuzzy after a while,” he said. Lawlor used antler points and branches to identify individual bucks, but identifying individual does is much harder. The Old Colchester survey, possibly the most thorough one ever conducted on Mason Neck, revealed an estimated population of up to 60 deer in the 139-acre park, the equivalent of 278 deer per square mile – a lot. Naturalists estimate that the healthy population of deer in an eastern forest is 15 to 20 per square mile. Another survey was conducted at Old Colchester this fall, and those photos will be analyzed over the winter. Huntley Meadows Park Manager Kevin Munroe said that Northern Virginia has an overstock of deer because there’s often much more food available for deer in a suburban setting than in a pristine forest. Lawlor added the amount of nutrients deer can ingest in suburbia could be ten times that of a forest and that people think fertilizer feeds plants. He said fertilizer is nutrients for deer. The large number of deer also affects forested areas. Some parkland has virtually no vegetation for four or five feet up from the ground except for invasive plants that deer won’t eat. Information like this, plus the input from the trail cameras, can be used as part of the structuring of a deer management plan. Oh, and those coyotes are widespread across the county, too. 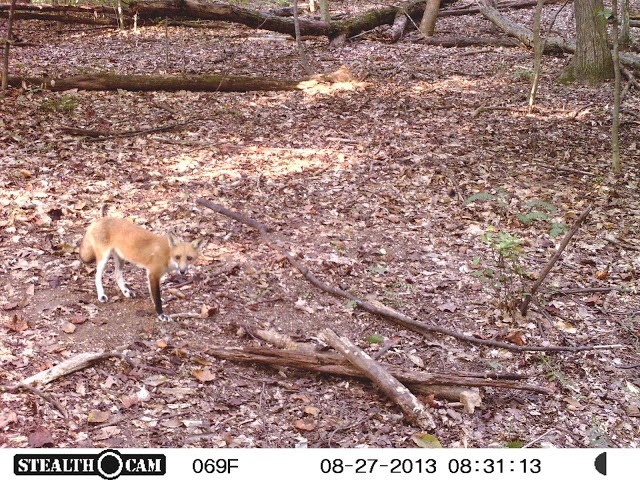 The Old Colchester survey also turned up a photo of a coyote on Mason Neck. Riverbend Park Head Camp Counselor Brian Balik, Huntley Meadows Resource Manager Dave Lawlor, and Stewardship Communications Manager Dave Ochs contributed to this story. This entry was posted in Uncategorized and tagged Coyotes, Deer Management, Ellanor C. Lawrence Park, Huntley Meadows Park, Invasive Plants, nature, Old Colchester Park and Preserve, outdoors, Raccoons, Red Fox, Riverbend Park, Trail Camera, White-tailed Deer, Wildlife, Wildlife Camera on October 17, 2013 by Fairfax County Park Authority. The temperature is 71 degrees outside right now. One of those to-die-for fall days, a blue sky with cloud puffs balanced on a bowl of Trix-colored trees – raspberry red, lemon yellow, and orange orange. I’m lucky. I have a window in my Herrity building office. 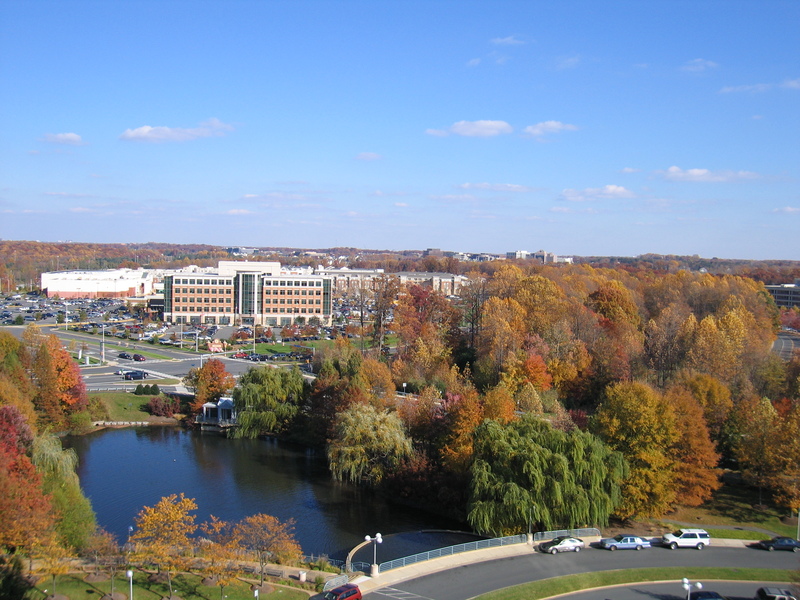 It overlooks a patch of trees that sits between the Fairfax County Government Center and the Fairfax Corner shopping center. Probably doesn’t sound very exciting to a naturalist or volunteer who spends time at a place like Burke Lake or Huntley Meadows, but that patch of trees is important to me. There are times when it’s mine, and just mine. Nobody else around it. I do a lot of writing, and those trees are often my inspiration, something to look at when I need to clear my mind. Often I look at them and words start bouncing through my keyboard. Like now. Remember sitting in your office and staring out a window, wishing you were outside because it was such a beautiful day? See? It’s true. Writers write what they know. The article talked about remembering those days you wished you were outside, and then getting outside when you have the chance. Or maybe, instead of waiting to see if we have a chance, maybe we should create that opportunity. Consciously decide to go take a walk in a park. There are over 400 county parks with patches of trees like my little one outside my window and across the street. Every one of them is an opportunity for a moment of refreshment. It is a nice day. Blue sky, autumn-drenched trees nearing their peak, perfect temperature. Those trees, like the ones in parks all over the county, aren’t very far away from me. Probably some not far from you, either. I think I see an opportunity before I go home. Author David Ochs is the Manager of Stewardship Communications for the Fairfax County Park Authority’s Resource Management Division. This entry was posted in Uncategorized and tagged Autumn, Burke Lake Park, Fairfax County, Fall Colors, Huntley Meadows, Leaves, nature, outdoors, Parks, ResOURces, Riverbend Park on October 1, 2013 by Fairfax County Park Authority. 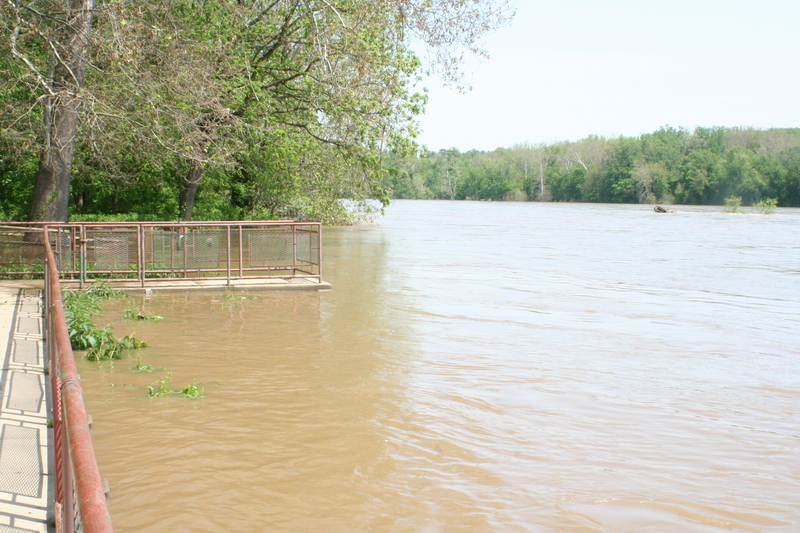 Everyone here at Riverbend Park has seen some form of the water rising at one point or another. Some of us have seen the raging overflow of whitewater pouring from the trails, others have seen the picnic areas flooded out and have chased picnic tables down the river. Others still have seen only small increases that close the boat ramp. This time, we’re not quite to raging whitewater, but this one is still pretty exciting. …tends to be pretty easy to spot. Another way is to look at the caution levels painted on our boat ramp. When the boat ramp closes, you know it’s getting high. 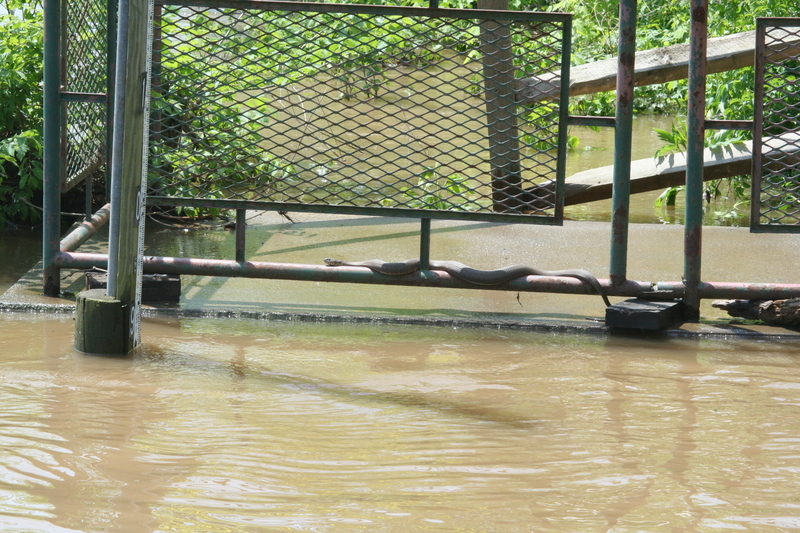 The boat ramp closes when water levels get too high to safely launch. Finally, we also look online. We use information collected from our friends at NOAA to follow the changing water levels. You can do so as well here. 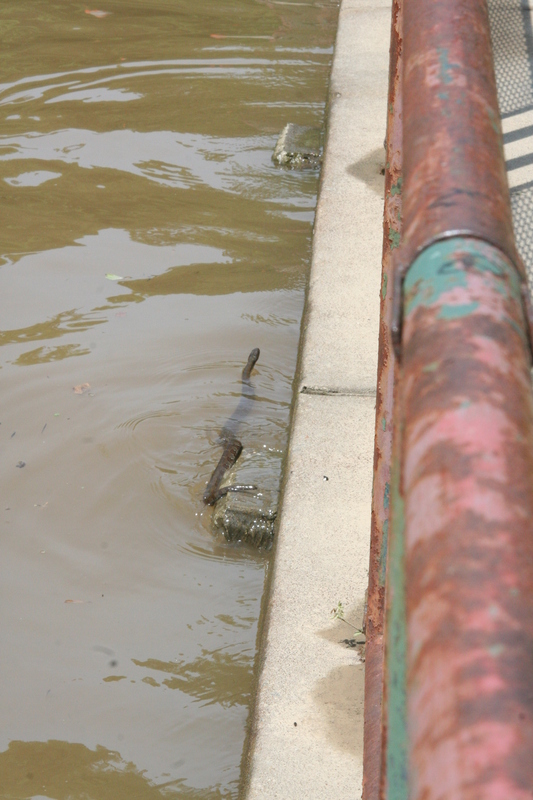 This Northern Water Snake hangs out on the bottom railing of the walkway as water levels rise. 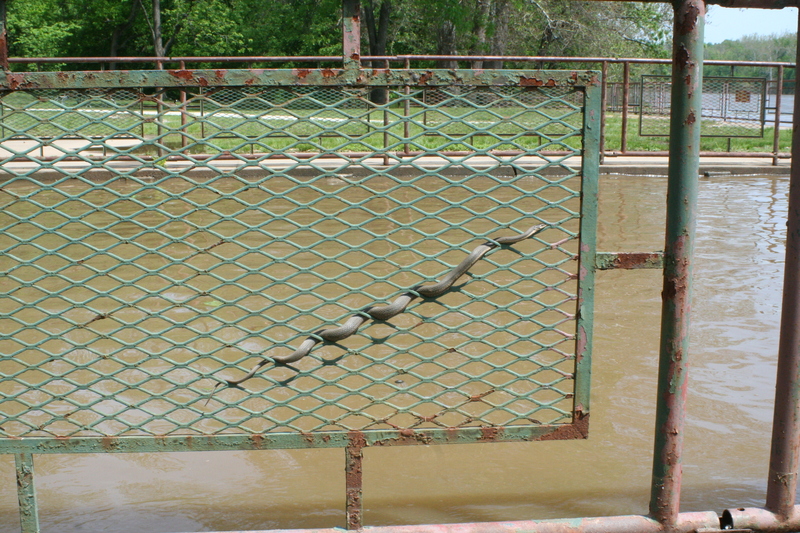 This Northern Water Snake looks for a safe place away from curious school children and rising waters. 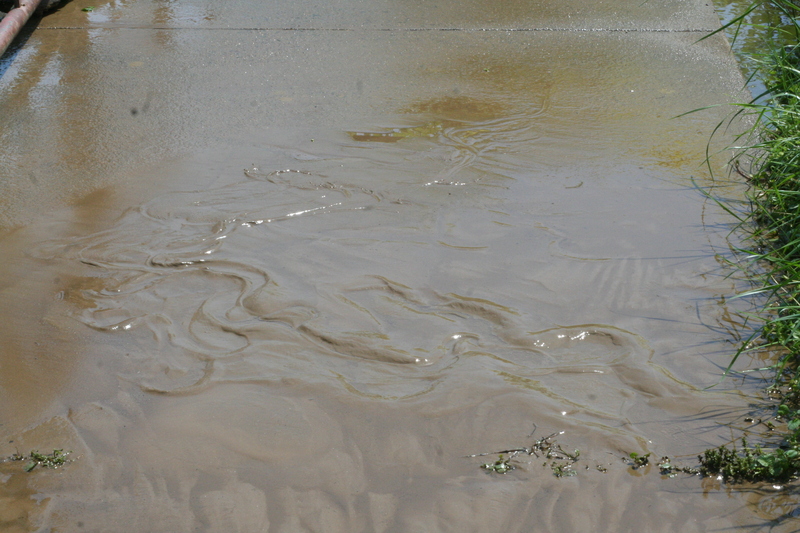 Tracks of snakes in the mud show evidence of those that evacuated early. 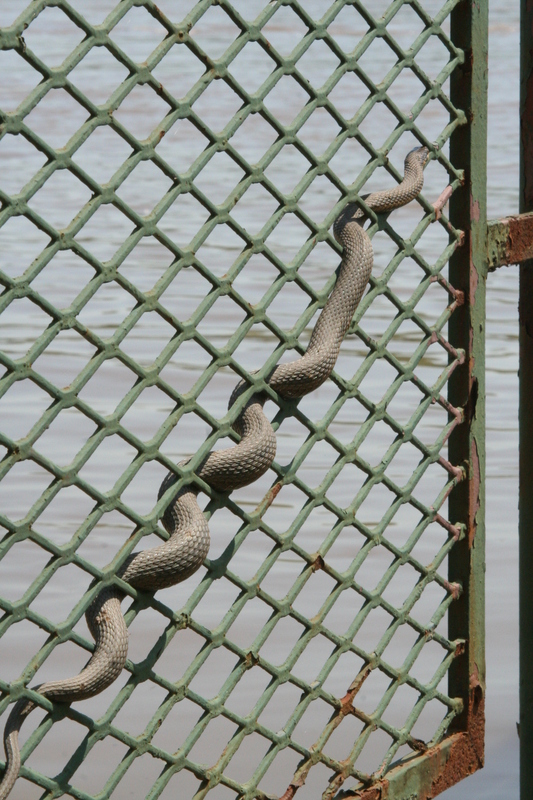 This Queen Snake has found an artistic way to avoid the rising waters. 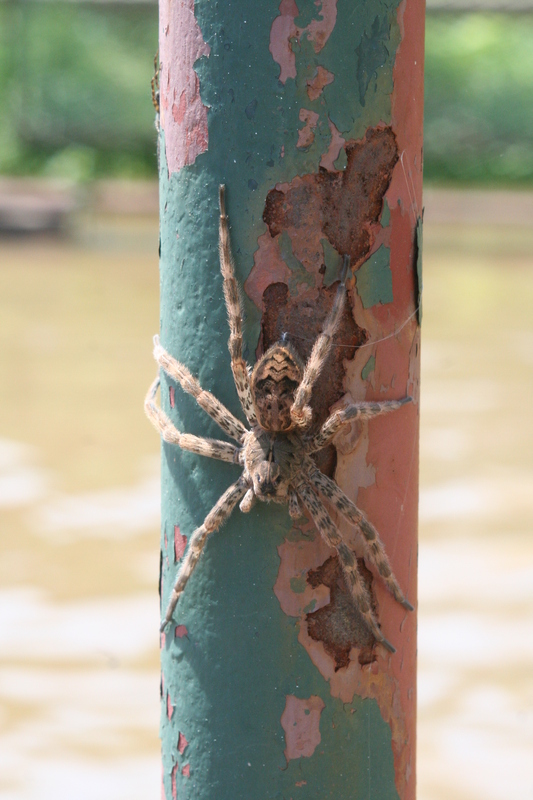 A Dark Fishing Spider spins a safety harness out of silk on a fence post. 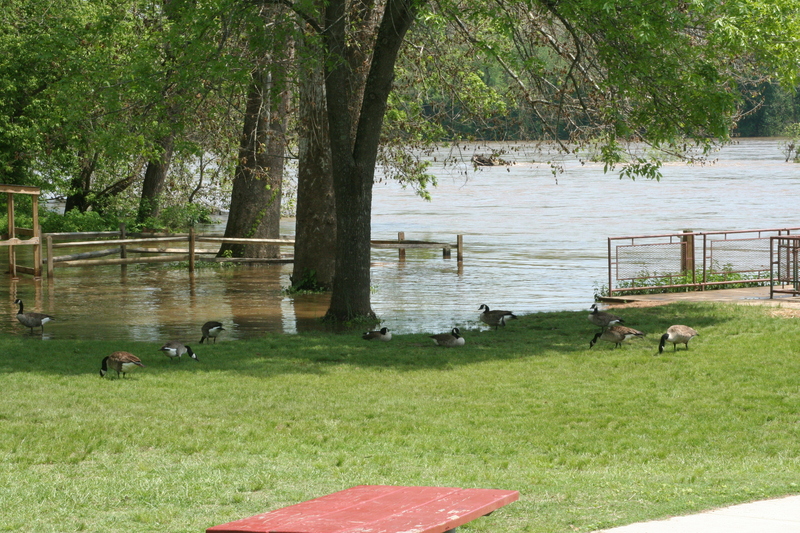 The Canada Geese hardly seem to mind the rising water in the picnic area near the kayak racks. 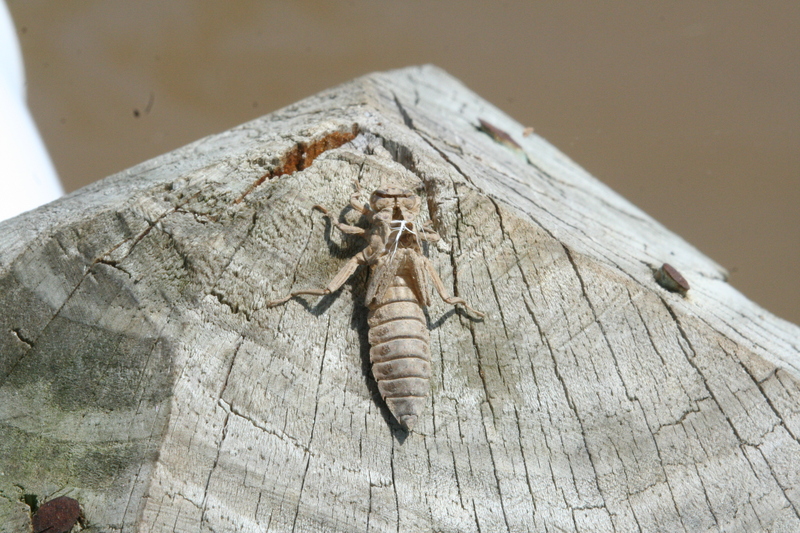 Dragonflies are emerging from the water and leaving behind their exoskeletons on fence posts. 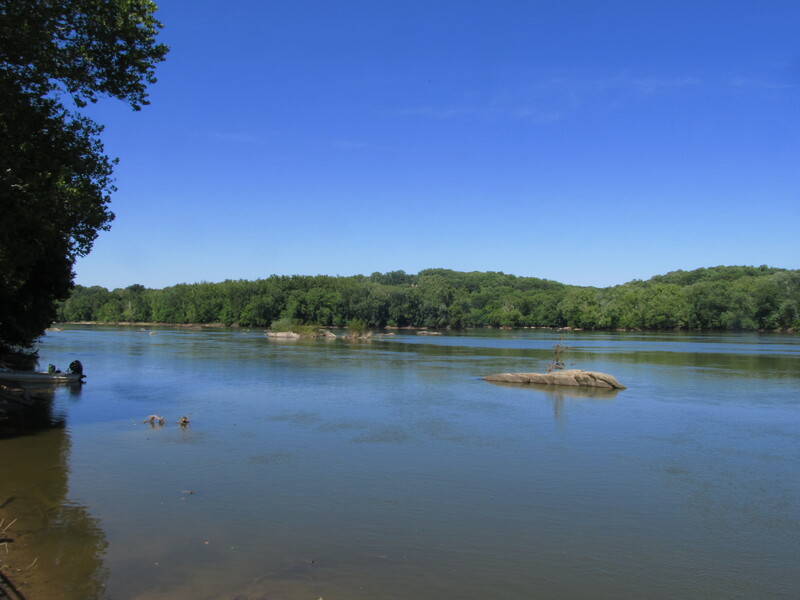 Be sure to check out the river this Mother’s Day weekend…though you might want to save the Potomac Heritage Trail for another weekend. 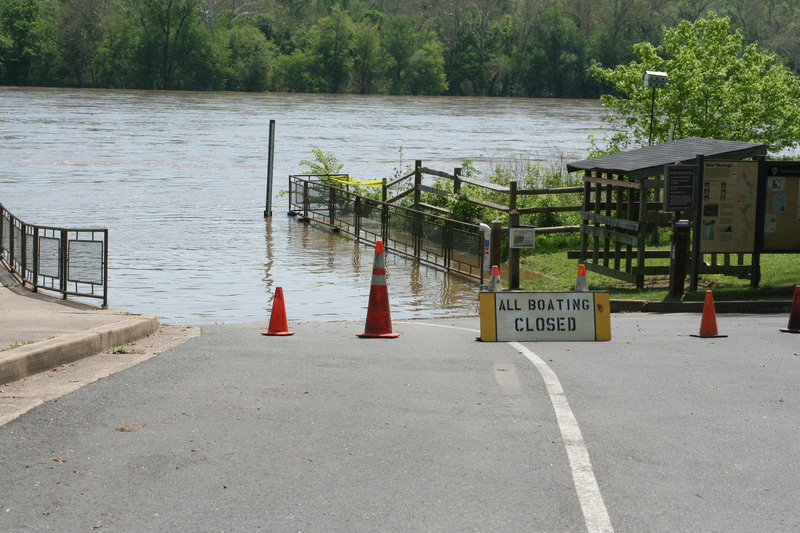 The water takes over the Potomac Heritage Trail. This entry was posted in Uncategorized and tagged Dark Fishing Spider, Flood, Great Falls, nature, Northern Water Snake, outdoors, Potomac River, Queen Snake, Riverbend Park, Virginia on May 10, 2013 by Fairfax County Park Authority. If you’re like me, by March the spring jitters have well and truly set in. Balmy teases of April weather spark bouts of cabin fever. The drip of snowmelt, the lengthening of days and, to a nuanced eye, the presence of egg masses in our region’s vernal pools all herald the arrival of warm weather, regardless of what the groundhog sees.As of this morning, however, there is still snow on the ground. My car thermometer read a frosty 36 degrees at 8 a.m. Major League Baseball teams are playing spring training games, but Old Man Winter is still around for two more weeks. Instead of holing up next to the fireplace with a thermos, pining for that day you can spring your clock forward one hour, my suggestion is to get outside! Winter presents fantastic opportunities to observe wildlife, you just have to know where and how to look for it. At Riverbend Park, migratory ducks make this relatively calm section of the Potomac River their home during the winter months. Hundreds of ring-necked ducks, common mergansers, coots, buffleheads, redheads and many other species can be found dabbling and diving in the open water right in front of our visitor center. These ducks will be gone by April, so there’s only a narrow window to catch sight of our friends from up north. A pair of binoculars is an important tool for winter wildlife enthusiasts and not just for spotting waterfowl. The absence of foliage makes viewing from afar a rewarding pursuit. A long hard look at the sycamores and silver maples on river-dividing Watkins Island may yield a glimpse of the fox squirrel, a large tree squirrel more common in the Western reaches of the state than here in the Piedmont. Deer leave hoof prints in the snow. While some of Riverbend’s warm-weather birds take to the tropics for the winter, others stay year round. Winter can prove to be the best time to view some real dazzling plumage against an otherwise stark background. The reds, yellows, blues, and gold of resident woodpeckers, cardinals, jays, and bluebirds create a vibrant, dynamic palette in and around the bird feeders on the visitor center patio. Woodpeckers like the yellow-bellied sapsucker and finches like the Pine Siskin are some of the rarer species seen by Riverbend naturalists this time of year. A walk through the woods after a snowfall can also provide clues as to which wintering mammals are active this time of year. 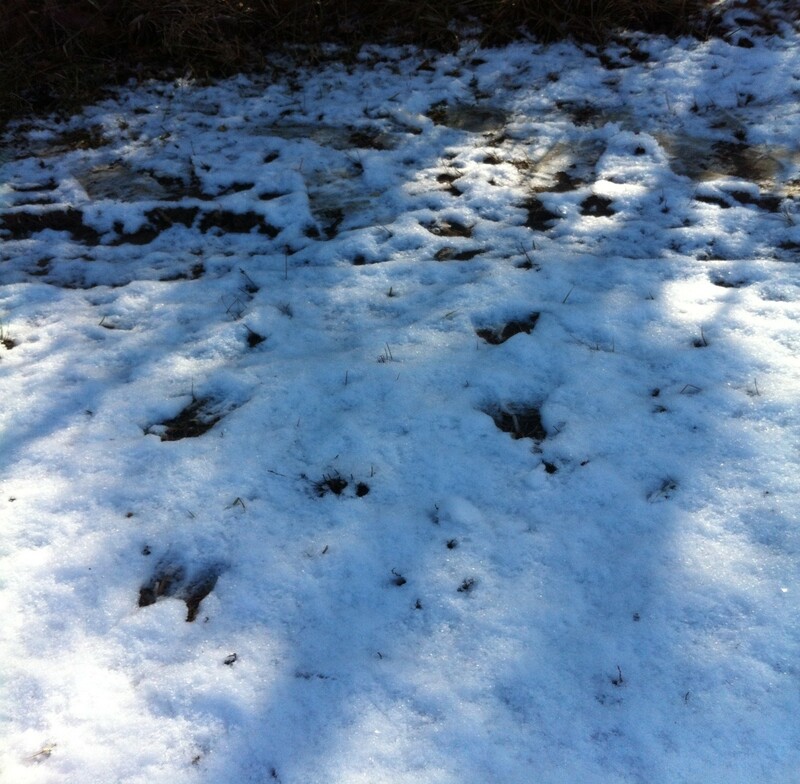 Along the flood-plain, footprints in the snow-flecked ice reveal the presence of a pair of otters. Somewhere along the riverbank, their den, a maze of tunnels burrowed into the hillside, will soon house baby pups. For now, the path of the footprints suggest the otters have been popping in and out of air holes cut into the ice; perhaps evidence of playful courting before the female accepts the male as her mate. Winter gets an unfair rap as a period of lifelessness, sandwiched in between the colorful transformation of autumn and the fresh energy of spring. Venture out to Riverbend, or any other FCPA park and you will become instantly aware of winter’s dynamism and beauty. The faint quacking of ducks, the echo of pileated woodpeckers drilling for insects and faded hoof prints in fresh snow are subtle reminders that nature can brave the cold better than we can. This entry was posted in Uncategorized and tagged Bluebirds, Cardinal, Ducks, Jays, nature, Otters, outdoors, Potomac River, Riverbend Park, Woodpeckers on March 8, 2013 by Fairfax County Park Authority. We’ve finally reached the peak time to view the Virginia bluebells at Riverbend Park. With the blast of warm weather this week the Virginia bluebells are really blooming. For the next 10 days or so the bluebells will put on a beautiful display. In places along the river trail you are virtually surrounded by them. Don’t wait. Now is the time to come out and witness this spectacular display, because by May they will virtually disappear until next spring. The Virginia bluebells are in full bloom. Don’t forget to join us at Riverbend Park this Saturday, April 13 from 10 a.m. until 2 p.m. as we celebrate the bluebells at our first annual Bluebells at the Bend Festival. The event costs just $5 person and features live music, wildflower walks, live animals, face painting, wagon rides, and other family fun activities. For more information, call Riverbend Park at 703-759-9018. 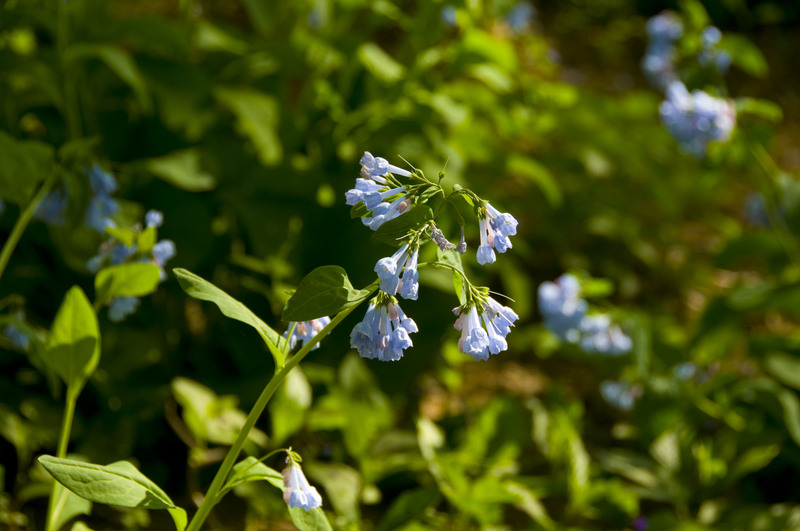 Come enjoy the trails lined with Virginia bluebells. 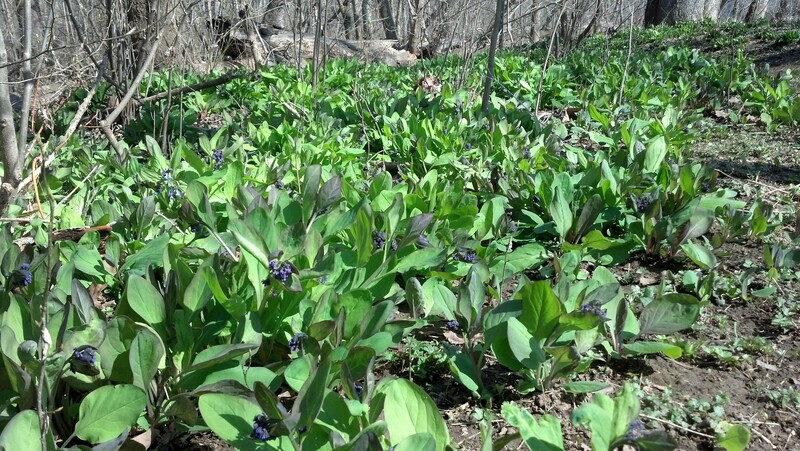 Virginia bluebells are beginning to carpet the floodplain. The bluebells seen carpeting the floodplain on April Fools Day were no hoax. 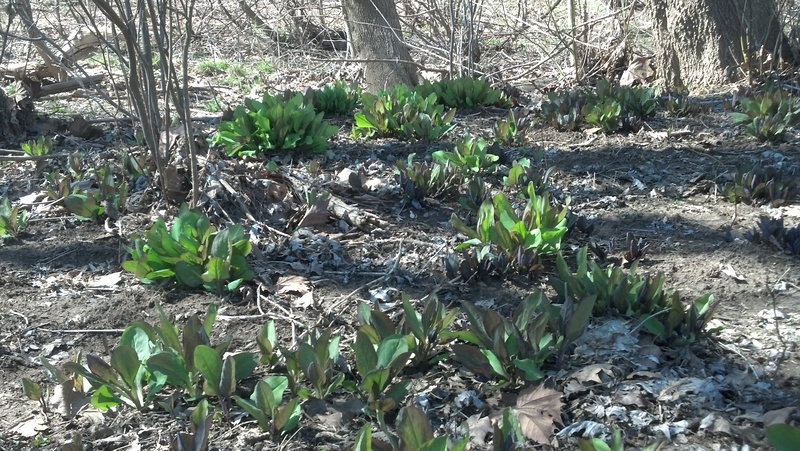 Despite late March cold and snow the hardy plants are continuing to grow and take over the forest floor. The dark leaves have now taken on their familiar succulent green color and the deep purple flower buds are clustering. Deep purple buds are beginning to flower. The coming weeks will offer visitors one of nature’s finest floral displays. Spring beauties, cut-leaved toothworts, sessile trilliums, and a host of other beautiful wildflowers will mix in and add texture to the lavender bluebell palette. Don’t forget to join us at Riverbend Park on April 13 from 10 a.m. until 2 p.m. as we celebrate the bluebells at our first annual Bluebells at the Bend Festival. The event costs just $5 per person and features live music, wildflower walks, live animals, face painting, wagon rides, and other family fun activities. For more information, call Riverbend Park at 703-759-9018. Last year the bluebells peaked in March with early warm and dry conditions. This year the bluebells are on their more “typical” schedule and should peak between April 5 through 15. Usually a good rule to follow is get your taxes done a little early and then come out and enjoy the bluebells. Virginia bluebells are beginning to spread across the floodplain at Riverbend Park. If you can’t make it out during that time, do not be discouraged. There will still be plenty of wildflowers in bloom from the end of March through April. Also, because of the park’s topography not all bloom at once, so you will always find patches of blooming plants in the spring. Flower buds are beginning to appear. Once blooming is over and the plants develop seeds, they rely on some busy insects to help plant more. Myrmecochory, from the Greek myrmeco “ants” and chory “dispersal,” is seed dispersal by ants. This ecologically significant ant-plant relationship is worldwide and beneficial to both. The plants produce seeds that have a fatty rich substance attached to them called eliasomes. Worker ants collect the seeds and take them back to their colonies where the eliasome is removed and fed to growing larvae. Once the eliasome is removed the ants either discard the remaining seed underground or they eject them from the colony in nearby soil. This act accomplishes two things. Seeds are deposited in more favorable locations for growing and they are spread, ultimately adding more plants to the population of wildflowers. So when you visit Riverbend Park to see the bluebells, stop and give thanks to the marching ants at your feet. March has arrived with a mix of warm, cold, wind, rain, and, yes, a little snow. 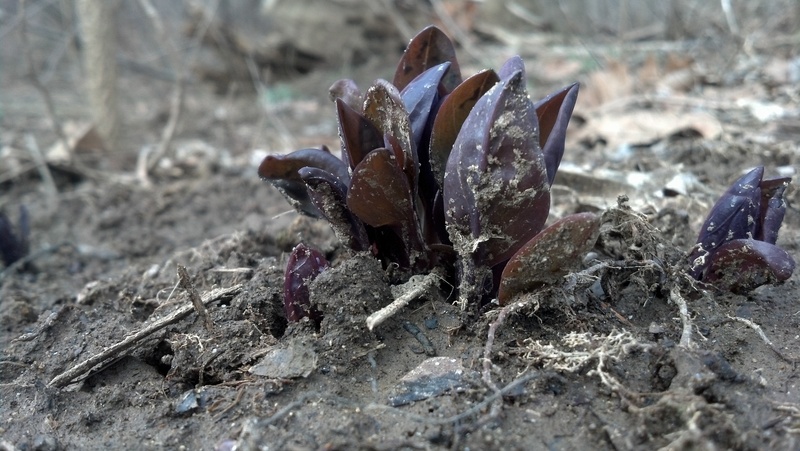 Despite the ever changing weather, the Virginia bluebells continue to push through the soil. Leaves are beginning to change from deep purple to hints of delicate green as chlorophyll is formed from longer days. 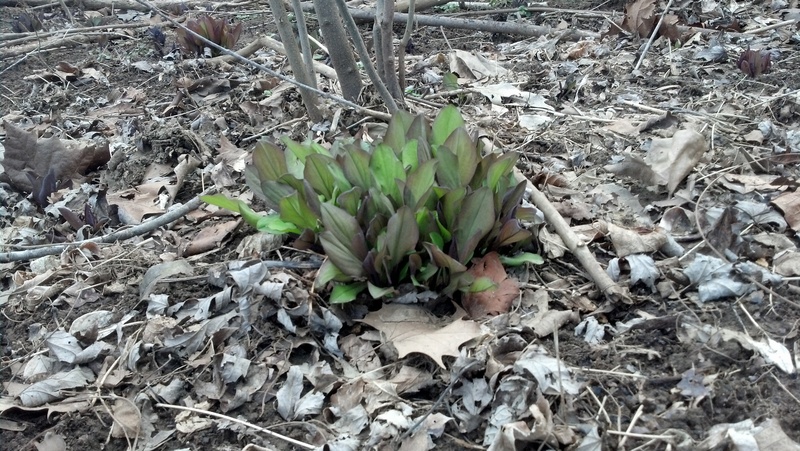 The purplish leaves of Virginia bluebells are turning green. Bluebells, along with many other spring wildflowers including spring beauties and cut-leaved toothwort, are called spring ephemerals. They bloom early, and then by May all that is left are withering leaves and seeds. Come mid-May, bluebells pull a vanishing act leaving no visible trace of their existence. All of these hardy wildflowers take advantage of the sunlight reaching the forest floor before the towering trees grow their leaves. In March, more than 50% of the available sunlight reaches the forest floor. By mid-April this drops to 30%, and then by May only 10% is reaching the ground. Check out next week’s update for a prediction of when the bluebells will peak! Also, learn about some amazing insects that help plant more wildflowers. Don’t forget to join us at Riverbend Park on April 13 from 10 a.m. until 2 p.m. as we celebrate the bluebells at our first annual Bluebells at the Bend Festival. The event costs just $5 person and features live music, wildflower walks, live animals, face painting, wagon rides, and other family fun activities. It is the beginning of March with snow in the forecast but there are signs of spring everywhere. 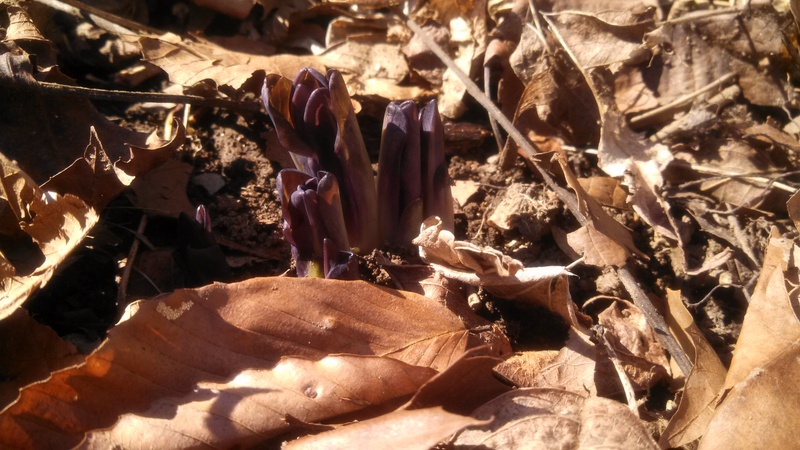 Tree buds are swelling, birds are in motion, singing as they go, and the Virginia bluebells (Mertensia Virginica) are poking their leaves through the sandy floodplain soil. Virginia bluebells, also called Virginia Cowslip, Tree Lungwort, Roanoke-bells, Mertens, and Oysterleaf put on a dazzling display at Riverbend Park from late March to mid-April. These flowering plants burst with intense purplish blue flowers that literally carpet the forest floor next to the river. Virginia bluebells poke through the sandy soil. 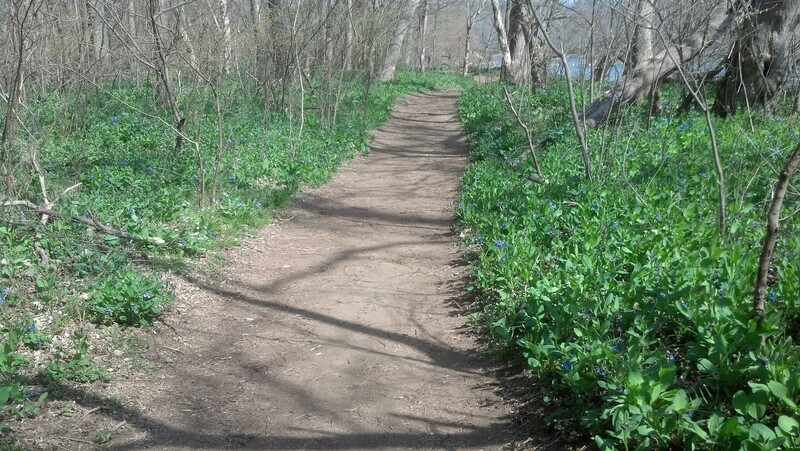 Bluebells line the trail at Riverbend Park. Virginia bluebells are native wildflowers that are beneficial to early pollinating insects including bumblebees, honeybees, and butterflies. Check back regularly to see the progress of the bluebells as they prepare for their annual spring show. Join us at Riverbend Park on April 13 from 10 a.m. until 2 p.m. as we celebrate the bluebells at our first annual Bluebells at the Bend Festival. The event costs just $5 person and features live music, wildflower walks, live animals, face painting, wagon rides, and other family fun activities. For more information, call Riverbend Park at 703-759-9018. This entry was posted in Uncategorized and tagged Bluebells at the Bend Festival, Mertensia Virginica, nature, outdoors, Potomac River, Riverbend Park, Virginia Bluebells, Wildflowers on March 4, 2013 by Fairfax County Park Authority.